Treat yourself to this springtime rhubarb pie. 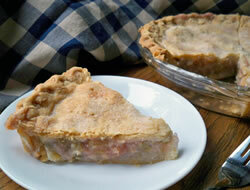 Rhubarb adds a touch of tartness to this sweet and delicious pie. There is nothing better than that first piece of rhubarb pie made from your first pick of rhubarb. Dice rhubarb and place in a large bowl; set aside. Using two bowls, mix half of the sugar, flour, and tapioca pudding mix in each. Stir each half to mix ingredients evenly. Mixing half at a time helps to mix these ingredients more evenly. Pour half the sugar mixture over the dice rhubarb; mix well and then add the other half of the sugar mixture. Stir all together to coat rhubarb evenly. Place the bottom crust in the pie plate. 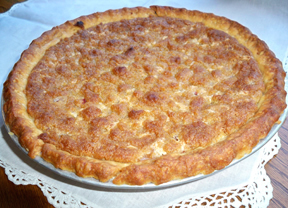 Carefully pour the rhubarb and sugar mixture into the bottom pie crust; spread out evenly. Slowly pour the half & half over the rhubarb and sprinkle with a pinch of salt. Moisten the bottom crust all around the top edge so the crust seals better when the top crust is placed on top. Place the top crust on the pie; crimp the edges and trim off excess crust from the edges. Make several slits in the top crust to allow the steam to escape as the pie bakes. Sprinkle the top crust lightly with sugar. Cook the pie in the microwave for 5 minutes before placing in an oven preheated to 350 degrees F.
Bake at 350 degrees F. for 10 minutes and then turn down the oven to 325 degrees F. Bake for another 45 to 60 minutes, or until the pie filling is bubbling and the crust is nicely browned. 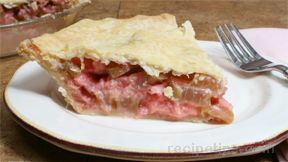 "I have been looking for a rhubarb pie recipe like my mom's forever and this one taste so much like her's. I think I can quit looking. 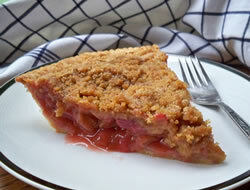 I can't wait to have enough rhubarb so I can make it again. This is a delicious recipe . . . makes me think of mom!"